Austin, TX (June 10, 2015) — After the recent heavy rainfall and flooding hit Bryan, TX in the Brazos Valley, Hellas crews broke ground at James Earl Rudder High School today to replace the existing track with epiQ Tracks® S200 running track and convert the natural grass field to Matrix® Turf with Realfill® infill for their soccer and football teams. The $1.1 million project will be completed in mid-August. The practice facility will have full construction consisting of the new track and turf surface, drainage system, goal posts, and D-zones with an epiQ Tracks® S200 surface. 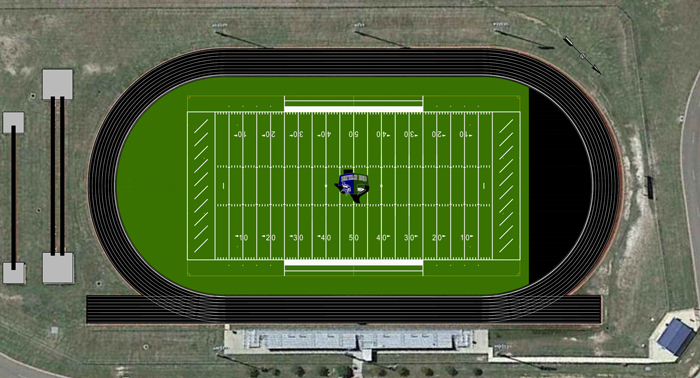 In addition to the construction, the turf will have the Bryan ISD logo inlaid at centerfield. The logo is a combination of the James Earl Rudder High School Ranger and the Bryan High School Viking mascots.